California Baptist University’s basketball teams defended their home turf Feb. 8, with back-to-back wins against rival Azusa Pacific University in both the men’s and women’s games. As the PacWest’s fifth-place seat, the women’s team won 54-46 before the men’s victory of 74-55, avenging their only loss of the season to APU on Jan. 24. Compared to the game at APU, the Lancers decided from the beginning that they would set the tempo. 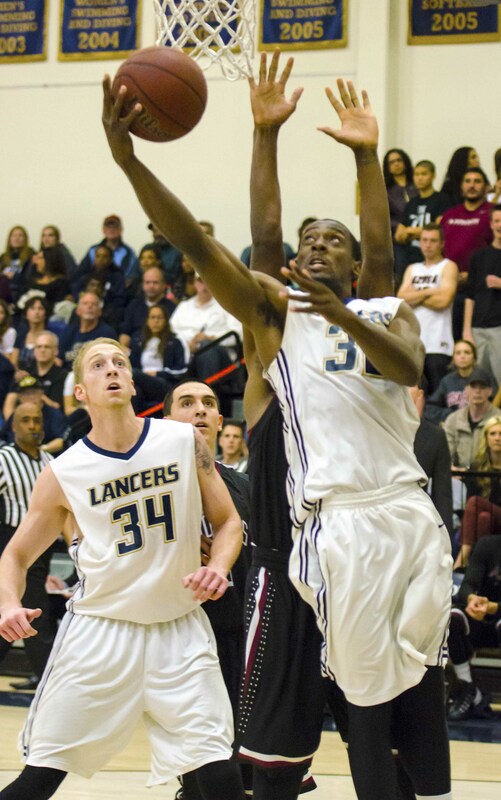 The CBU men’s team held a 16-game streak of victories this year until the previous game against APU. Bryce Oldham, sophomore computer and electrical engineering major, plays guard on the men’s basketball team and said he was thankful for the seniors and their leadership shown throughout the game. Croy said he was proud of his team’s focus and drive throughout the game. The Van Dyne Gymnasium was at full capacity, turning away hundreds of both Lancer and Cougar fans. As the women’s game ended, the Crazies rapidly began multiplying, filling the gym within minutes. About 100 fans from APU could be seen behind their team on Saturday night. Underneath the yellow Crazies banner, a full house of students stood ready to joust in school spirit. As the rivalry continues to grow, Parker said he is excited to see it expand into other sports. With the wins from Saturday, the men’s team stayed on top of the PacWest with a 14-1 conference record, and an overall record of 20-1, leaving the Cougars to drop to 11-9 overall and 7-7 in the conference. For the women’s teams, the Lancers improved to 11-10 overall, with a 9-6 record in the PacWest. The Cougars fell to 14-6 overall and 12-2 in conference.